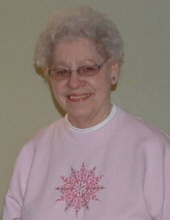 Patricia A. Petrasovits, 86, of Coplay passed away peacefully surrounded by love on Sunday, February 3, 2019 while in the care of Fellowship Manor. Patricia was born at home in Coplay on January 25, 1933 to the late Earle G. and Genevieve (White) Proctor. In 1997 she was preceded in death by her beloved husband of 35 years, William J. Petrasovits. Patricia belonged to St. Peter’s Church in Coplay where she was a very active volunteer and longtime member of the Altar & Rosary Society. She was employed as a secretary at the former First National Bank in Allentown for 40 years before retiring in 1991. Survivors include sisters Earleen P. Costello, wife of the late Albert M. Costello and Joan, wife of Kermit W. Kunkle both of Northampton, and many nieces and nephews and great nieces and nephews who will deeply miss her precious smile and gentle spirit. She was predeceased by brother, Earle Proctor, Jr.
A Mass of Christian Burial will be celebrated at 10:30am on Friday, February 8, 2019 at St. Peter’s Catholic Church, 4 S. 5th. Street, Coplay, PA 18037. There will be a viewing from 9:30am – 10:30am on Friday at the Church. Arrangements are entrusted to Brubaker Funeral Home, 327 Chestnut Street, Coplay, PA. In lieu of flowers, memorial donations may be made to the church, c/o the funeral home. To plant a tree in memory of Patricia A. Petrasovits, please visit our Tribute Store. "Email Address" would like to share the life celebration of Patricia A. Petrasovits. Click on the "link" to go to share a favorite memory or leave a condolence message for the family.